On Sunday I decided to make a pot of gumbo for dinner. Maybe it was due to the fact that it was a cool, wet, blustery day. Or that Mardi Gras is here. Either way, I wanted to get my Inner Louisianan on. Which is weird, because I’ve never been south of Virginia. But I do know that we picked up Louisiana for a song, thanks to history class. And that the cuisine from that region is delicious. Just a couple of weeks ago, I had crawfish etouffee from a restaurant in Portland and sucked the meat right out of their heads, as you are supposed to do. So I guess I’ve had Southern cookin’ on my mind. I’ve made gumbo before, so this wasn’t exactly a first. 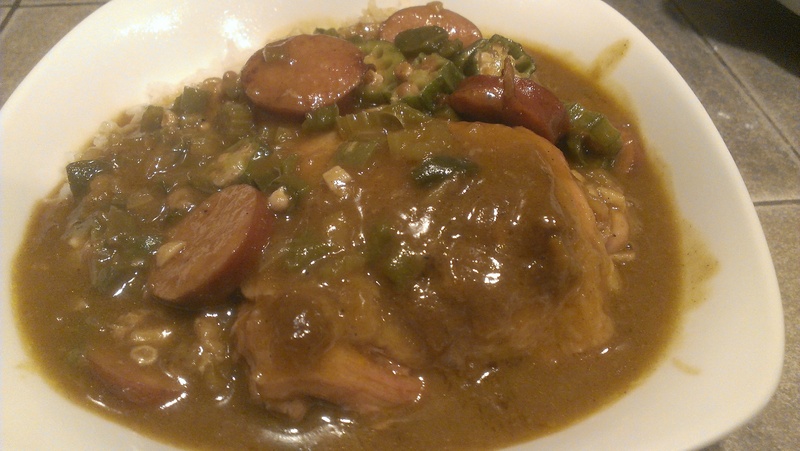 The key to a good gumbo is the roux. This mixture (equal parts fat and flour) takes constant stirring and a lot of time. At least an hour. The goal is to have it turn the color of an old copper penny. So I diced all my vegetables, measured out my spices and seasonings, and stood over the stove, stirring with a whisk. Records were playing to keep me entertained, but with nothing else to do, my mind inevitably started wandering. As my flour and oil mixture slowly darkened, I begin ruminating on a hundred different topics. That’s a nice, dark roux! I thought about how we’ll be moving next week. Saturday and Sunday were spent boxing things up and signing off on the lease, so it’s beginning to feel real now. And yet, oddly not. Even with all the framed pictures removed from the wall and decor packed up and a 6′ high stack of boxes in the entryway, the place still feels like home. Interestingly, when I moved out of my old house following the divorce eight years ago, there was nothing but relief. That place had stopped feeling like home months earlier. Clearly circumstances are far different this time around. I thought about how we came this close to buying a new bed over the weekend that would have cost thousands and thousands of dollars, only to come to our senses when we read the online reviews and realized Sleep Number is not the 8th wonder of the world. Instead, it sags in the middle and the mechanical parts break down. We settled on a pillow top instead. It may still sag in the middle after awhile, but it won’t cost us the price of a used car. I thought about what a great movie American Hustle, which we saw the night before, is. And how Christian Bale completely and convincingly lost himself in the role. And how badly comb-overs really work. And how the 1970s remain my favorite decade. I thought about how many choices kids in school have these days. Audrey had a freshman orientation last week, and electives she can choose include digital photography, game design, 3-D animation, robotics, sports marketing, floral design, alternative energy, mythology, architecture, Shakespeare, astronomy, horticulture, film study, video production, advertising, criminal justice, and Chinese. When I was in high school, I could take typing, be an office aide, or help out on the school newspaper. And I had to walk uphill in knee-deep snow for 3.5 miles EACH WAY just for the privilege of doing so! Times have changed, no? I thought about how The Walking Dead is a great show despite the fact that the seasons never change. It’s like perpetual summer there in Atlanta. And also, nobody ever gets a haircut, but if they did, wouldn’t everybody be walking around with really bad haircuts? Rick’s group doesn’t include any hairdressers that I’m aware of. I thought about how I work for the greatest company in the world, because Tuesday is Employee Appreciation Day, and they are actually honoring us with an afternoon Mardi Gras-themed event at a taproom in downtown Camas. During work hours. With booze and food and beads. It’s seriously ridiculous how much they spoil us. And no, I’m not complaining a bit. I thought about how it takes a big man to cry, but an even bigger man to laugh at that man. And then all thinking ceased because 90 minutes had passed, my arm was about to fall off from all the stirring, and Side 2 of “Goodbye, Yellow Brick Road” came to an end. So I added chicken broth and veggies, let the whole thing come to a boil, and poured myself a whiskey. Gumbo , I Gar … Ron… Teee….. It Gonna Be Good !! Great post, Mark! I had no idea a roux should take more than 10 minutes to make. Isn’t the choice of electives amazing? My kids could pick from things like Mandarin Chinese and CAD. I was happy to take bookkeeping in high school! My husband loves The Walking Dead, but it’s too violent for me. I do like to pick it apart though, so thanks for your observations! I wrote an entire blog post picking apart the fact that nobody ever rides bicycles in zombie movies or TV shows. Duh! Seems like a quick and efficient method of transportation to me. I loved this, Mark. Now I want to make gumbo. I’ve got the right playlist to queue up … all blues. To be honest, though, I might choose to stir up a great risotto … but I’m keeping the blues. Ahh, yes…blues are the perfect gumbo backdrop! Maybe some jazz, too. I’m thinking a little Duke Ellington, some Ella Fitzgerald, and you’re set for an afternoon of roux-stirring! Ha, ha. LOVE this post, Mark. These are all good things to think about. What a great title, as well. Hope your arm is okay. My arm has recovered, thank you very much. And I’ve got the biceps to prove it! (OK, not really. But at least I’m not stiff and sore when I lift things). My pleasure! It did turn out pretty good, I have to admit. Thanks for stopping by. I’m with the rest! Great post!! I’m sad that you are moving but I’m happy at the same time as I know that better things are going to come yours and Tara’s way. I’m glad you wrote that about the sleep number bed because honestly, that is what Pops and I were looking at getting down the road. I’ll stick with the mattress we have now as it really is a great mattress. I’m dumbfounded by all the electives kids get these days. Serioulsy?!?! We didn’t get even 1/10 of those. Let’s see…teacher’s aid, art and teacher’s aid and art. Yeah. That was about all I can remember! I don’t watch Walking Dead but I like your observations. Have fun today with your Mardi-Gras employee appreciation day and your gumbo looks delicious. I even love the taste in music. You should have your mind wander more often. Just sayin! Funny, I usually avoid these types of posts because I prefer to focus on one or two topics. But it was a nice excuse to clean out the brain pantry, if you will. This move is for the best in the long term, because it will enable us to cut our losses – well, MY losses – now, and in a few years, start fresh and new. Our NEXT move will be really exciting! Faaaaaaaaaaaabulous post, Mark! And the ending was STELLAR! And the best to you and Tara with your move next week. I’m sooooo happy and excited for you guys! Catholic school, eh? My dad has horror stories from those days. I’m grateful to at least have been able to attend regular old public school, even if our choice of electives was considerably more limited than kids have today. I think it’s amazing the electives kids can take now, but maybe they need them to cope in our fast paced world? Maybe so. I think it’s a more career-approached focus to schooling, which isn’t a bad thing. Isn’t the point of high school to prepare kids for the real world? Then why don’t they teach them about budgeting, responsible spending, how to job hunt, etc. Wow I’m impressed with all the classes she can take! Man, in Catholic school we had art once a week! Wow, things have changed and that’s cool her school offers so much opportunity to try things out. I forgot about art. No wonder I took that for something like three years…it was the only elective available! Get on the gumbo train already, girl. That stuff is good. Nice roux. I just spent 90 minutes two days ago. It’s tough stuff but it’s just a sacrifice I’ll make for great food. Thanks! It’s definitely a lot of work, but it seems like most things that are truly worthwhile take a little effort. Love the name of your blog, by the way.